B104 has your chance to win tickets to see Miranda Lambert at her concert at the State Farm Center in Champaign! 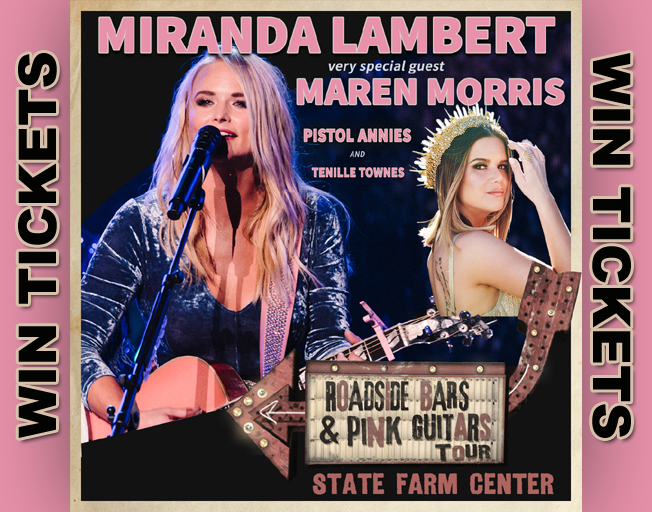 Miranda is bringing her “Roadside Bars and Pink Guitars Tour” with special guest Maren Morris, Pistol Annies and Tenille Townes to the State Farm Center in Champaign, IL Thursday, October 10th. Get complete concert and tickets details here. B104 Insider Rewards members can ENTER NOW HERE to win two tickets to the concert. If you are not a member of the B104 Insiders Sign-Up now. It is completely free and only takes a couple of minutes to register. That will give you access to all the benefits including exclusive winning like these tickets to Miranda Lambert! We will announce the winner of the tickets Monday, April 22nd. You need to make sure to Enter to Win by 11:59 PM Sunday, April 21st. Don’t miss this chance to win tickets to see Miranda Lambert’s “Roadside Bars and Pink Guitars Tour” at the State Farm Cent with Bloomington-Normal’s #1 Country, B104!